Sanctuaries engage in a management plan process on a periodic basis to evaluate site specific goals and objectives and management effectiveness. 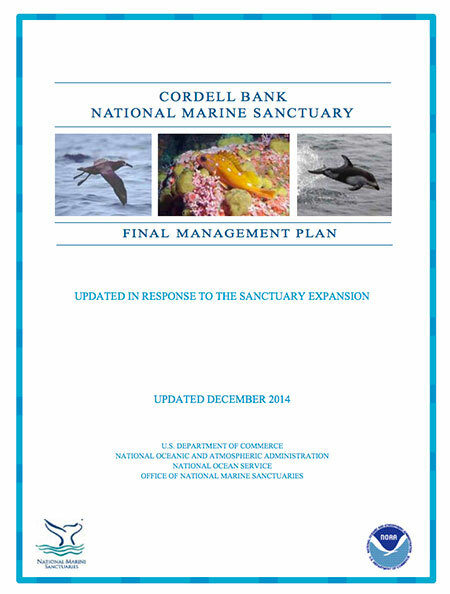 The Cordell Bank National Marine Sanctuary Final Management Plan (2014) (2.47 MB) builds on the two previous editions of the management plan, published in 1989 and 2008. The management plans lays the foundation for management of Cordell Bank National Marine Sanctuary resources, habitats and uses for the next five to ten years. It describes key sanctuary management issues and describes strategies to address them in five action plans: Education and Outreach, Resource Protection, Partnerships with Community Groups, Conservation Science and Administration. Some of the issues included are: emergency and preparedness response, ship strikes of whales, ocean anthropogenic noise, fishing gear and impacts on benthic habitats, and marine debris. The plan also contains cross-cutting action plans to facilitation coordination among the staffs of Cordell Bank, Gulf of the (now "Greater") Farallones, and Monterey Bay national marine sanctuaries, and the West Coast Regional Office. The management plan is supported by a final environmental impact statement (FEIS) (14.5 MB) for expansion of Cordell Bank and Gulf of the Farallones national marine sanctuaries, published in December 2014. The FEIS provides detailed information and analysis of a range of reasonable alternatives and analysis of potential environmental, cultural and socioeconomic impacts for the then-proposed expansion of the two sanctuaries' boundaries. In addition, this FEIS includes a summary of public comments received on the draft EIS, draft management plans and proposed rule, and NOAA’s responses to those comments. Management actions are implemented in accordance with regulations. The final rule (318 KB) for the sanctuaries’ expansion was published March 12, 2015. The regulations described in it as well as the revised terms of designation (91 KB) and management plan became effective on June 9, 2015, after a review period of 45 days of continuous session of Congress. Thenotice of the effective date of the regulations (7 KB) was printed in the Federal Register on June 15, 2015. The notice also announced that effective June 15, 2015, NOAA changed the name of Gulf of the Farallones National Marine Sanctuary to "Greater Farallones National Marine Sanctuary" and made some corresponding technical corrections to the regulations. The following libraries have copies of the Cordell Bank and Gulf of the Farallones national marine sanctuaries' final management plans (2014) and the Cordell Bank and Gulf of the Farallones Expansion Final Environmental Impact Statement (2014). These documents were produced prior to the name change from "Gulf of the" to "Greater" Farallones National Marine Sanctuary.